February is almost over and that means spring isn’t too far away, right? That’s what I keep telling myself, anyway! Lately we’ve had a couple of owls in the yard that provide beautiful music with their melodic hoots. Often, I fall asleep listening to them. Soon the robins will come back and join them … it’ll just be a few weeks before we see their beautiful red breasts. I love birds and as a kid, was overjoyed whenever I’d find one of their nests. It was like finding a pot of gold! 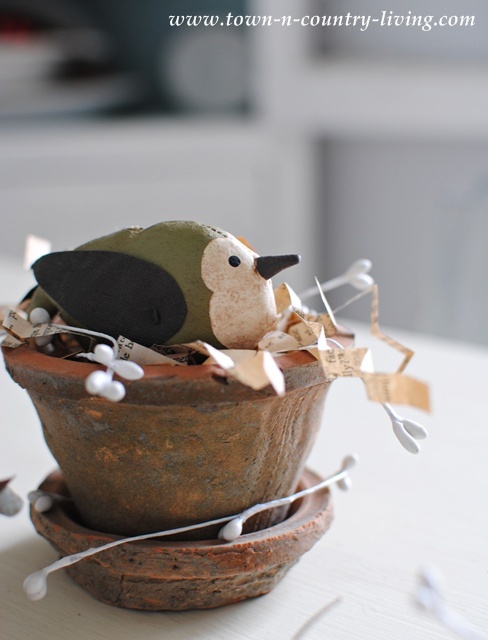 Recently I played around with how to make book page bird nests. I already had a bunch of faux eggs on hand … and this is what I came up with. 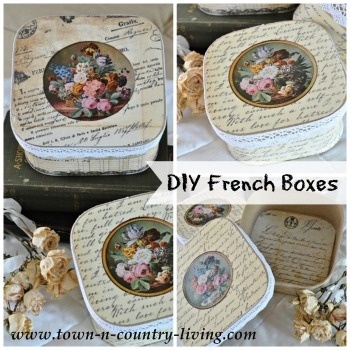 Shabby little bird nests to help me wait for our feathered friends to return. 1. 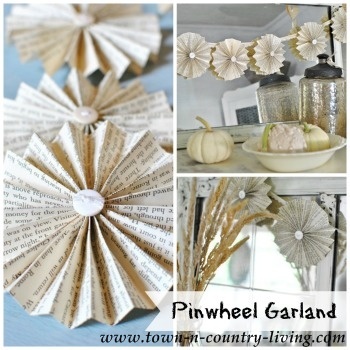 Cut thin strips of old book pages using a paper cutter or scissors. 2. Cut circles of various sizes from cardstock (I used the cover from the paperback book). These will serve as the base of the nest. 3. Put a ring of glue dots near the edges of the circle, or use glue stick, and gather about 4 book page strips with ends staggered. You want the nests to look a little messy. Keep telling yourself they don’t have to be perfect! 4. Make a circle with the book page strips and press the edges down onto the glue dots on the cardstock circle. It’s okay if you need to smash small parts of the strips onto the glue dots to make them stick. A bird’s nest is a little messy, after all. 5. Line up three to four book page strips together and place glue dots in several spots on the strips, making sure the glue dots touch more than one strip. Overlapping the glue dots onto more than one strip will keep the strips together. 6. Take the group of strips and carefully adhere them to the first circle of strips on the nest, making sure to place this group of strips slightly higher than the first set. This is how you build the sides of your nest. It takes a little careful finessing so try to be patient. Leave loose ends sticking out – you can trim any ends that are too long though. You can line the inside of the nests with leftover book page strips, using glue dots to adhere. 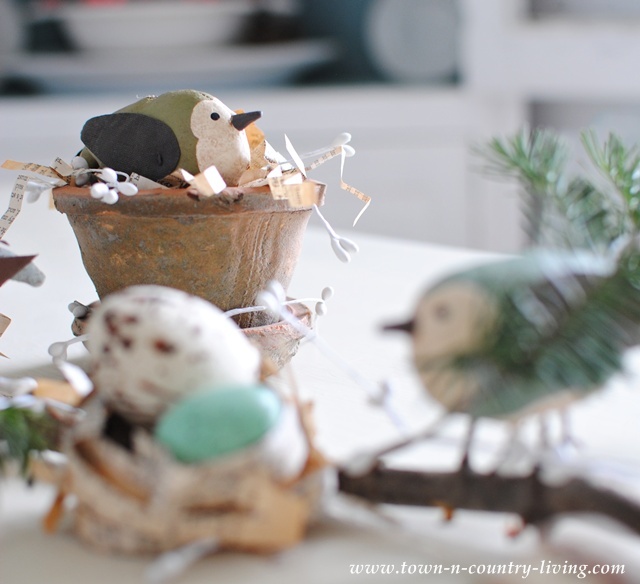 I found an evergreen branch outside to use as the foundation for a bird nest vignette. A trip to the local Country Naturals store resulted in some cute birds to go with the book page bird nests. I don’t know which I like more … the little birds or the nests. If you’re not particularly crafty, you can stuff a small pot with the book page strips to imitate a nest. I folded the strips accordian style before stuffing into my pot. Then simply place a bird or decorative eggs on top. My little birds and nests make me feel like spring is truly on its way. Warmer temperatures and sunshine this week are helping too. It’s been a rough winter for most of the country. Just adorable. I love that you used book pages for this – adds so much fun. How clever and cute. I love the nest and it couldn’t be easier and right in my budget. Two of my favorite things, birds and books! Love the idea. 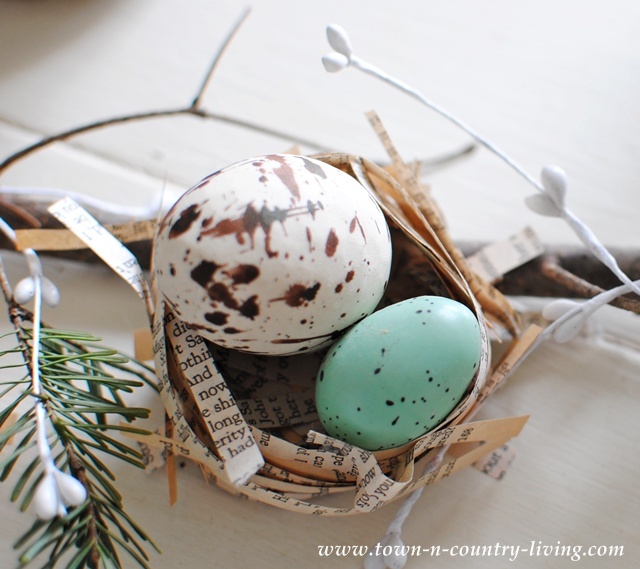 Have you ever made a nest with pine needles? I haven’t but thought it would be cute and realistic looking. There seems to be lots of dried needles around the base of pine trees. 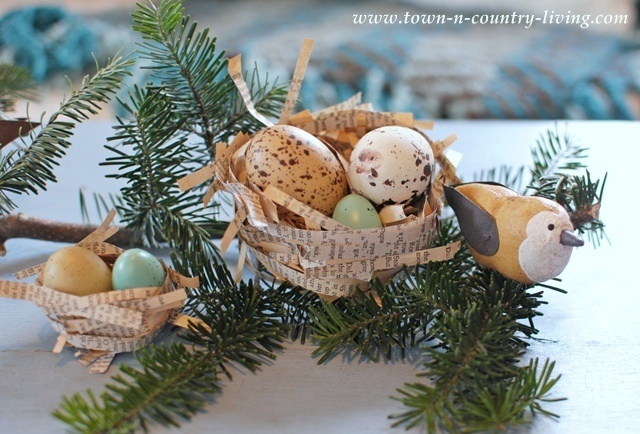 I love nests of any kind, but these are just too cute!!! And the little birds…adorable! this is so sweet, love this tutorial! I invite you to share at my hop today Hugs! (just piled in a heap) but now I know how to weave a nest. Jennifer this so very cute. Here’s to spring starting sooner rather then later. Such cute little nests. I love them! These are just adorable, Jennifer! 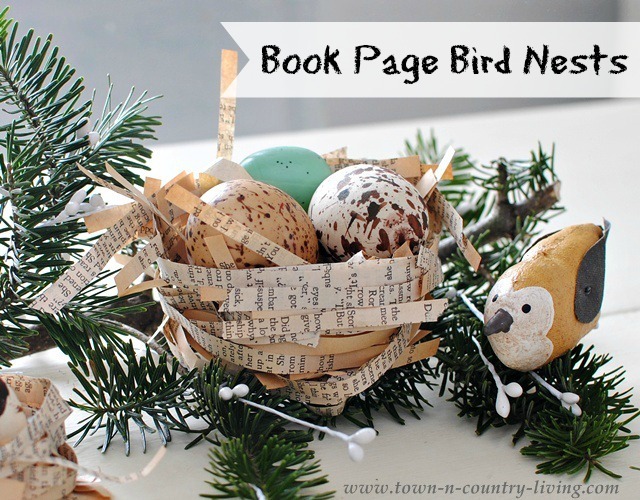 I love book page projects (and anything bird related) I’ll definitely be trying these out. Thanks! 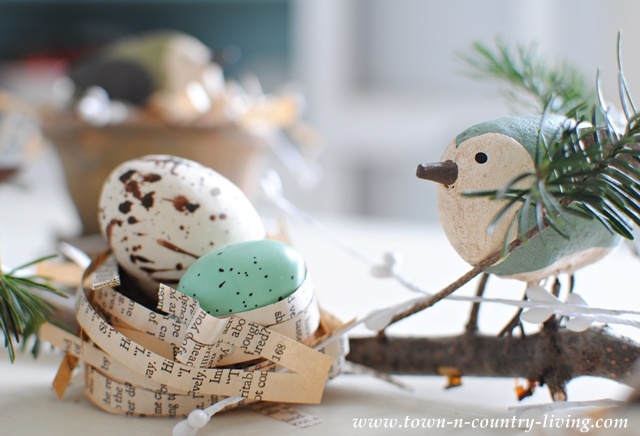 So cute – I love decorating for spring with pretty bird eggs!